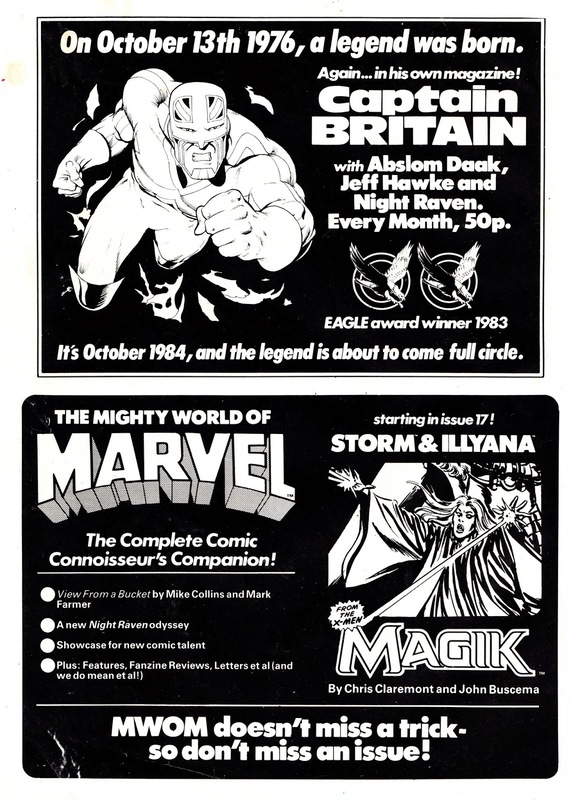 This full-page of MARVEL UK House Ads appeared in the 84th issue (the last with all black-and-white interiors trivia fans) of THE SAVAGE SWORD OF CONAN THE BARBARIAN monthly from October 1984. The top one previews the about-to-launch (it was slightly delayed, actually going on sale in December/ January) CAPTAIN BRITAIN monthly, a return to his own title after half-a-decade bumming around assorted (always about to close) M-UK monthlies. What's interesting here is that they still hadn't quite nailed the line-up: Jeff Hawke (presumably reprints) never did appear. Incidentally, a fanzine article from this period revealed that Alpha Flight was part of the in-house dummies, a strip that eventually went into MARVEL SUPER HEROES SECRET WARS instead. The other half-pager is promoting what was actually the final issue of THE MIGHTY WORLD OF MARVEL's second run (finally ending a run that, despite various name and frequency changes, could be traced back to the launch of M-UK back in 1972) and the beginning of a reprint run of the X-Men related Magik four-parter. Another full-page add elsewhere in the same issue announced that, as of the following month, it would be continuing in the pages of Conan itself (a merger every bit as bonkers as when the original Savage Sword was folded into THE AVENGERS in the seventies). The final issue of MWOM itself was distinctly lacklustre and apparently only allowed out the door to prime readers for the upcoming merger. The page count was dropped and the interior colour abandoned altogether. Needless to say, the changes extracted no downward pressure on the cover price.